With two weeks left in the season, it's time to consider the candidates for each of the league's regular season awards. We continue with the Kia NBA Rookie of the Year Award. Behind Doncic and Young in usage rate this season are Collin Sexton, Marvin Bagley III and Jaren Jackson Jr.
Rookies are not known for scoring efficiently, but three rookies -- Deandre Ayton (72.7 percent), Mitchell Robinson (70.2 percent) and Jackson (69.3 percent) -- rank in the top 25 in field goal percentage in the restricted area among players with at least 200 restricted-area attempts. 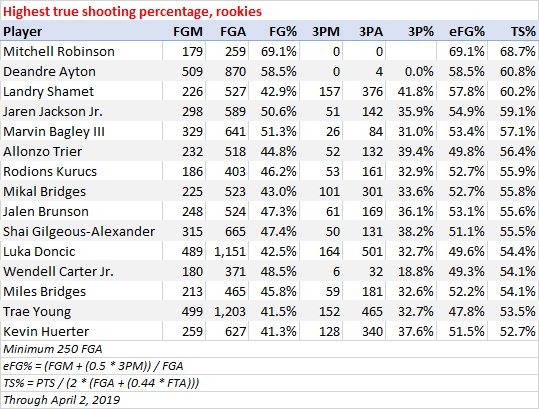 Ayton is just the second rookie (Ben Simmons was the first) in the 23 years for which we have shot location data to shoot 70 percent or better on at least 300 shots in the restricted area. Allonzo Trier (.431) and Doncic (.412), meanwhile, rank sixth and ninth, respectively, in free throw rate (FTA/FGA) among non-bigs with at least 500 field goal attempts. OffRtg = Team's points scored per 100 possessions with player on the floor. AST% = Percentage of teammate field goals player assisted on while on the floor. AST Ratio, TO Ratio = Assists/turnovers per 100 possessions used. Mitchell Robinson leads the league, by a wide margin, with 4.5 blocks per 36 minutes. That's the most for a rookie since the late Manute Bol averaged 6.8 per 36 in the 1985-86 season and the fourth most for any player (that's played at least 1,000 minutes) in the last 23 years, trailing marks of Serge Ibaka (4.8 in 2011-12), Alonzo Mourning (4.8 in 2005-06) and Hassan Whiteside (4.6 in 2015-16). Of course, Robinson also ranks second with 5.9 personal fouls per 36 minutes. He ranks 17th among rookies in total defensive win shares, with Jackson, despite playing just 58 games, leading the group by a pretty wide margin. The Grizzlies allowed just 102.4 points per 100 possessions with Jackson on the floor. That's the seventh-lowest on-court DefRtg among 220 players that have averaged at least minutes in 40 games or more this season. 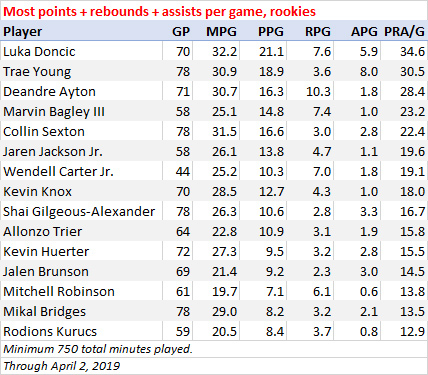 Only one rookie -- the LA Clippers' Landry Shamet (plus-97) -- has played at least 750 minutes and registered a positive plus-minus. 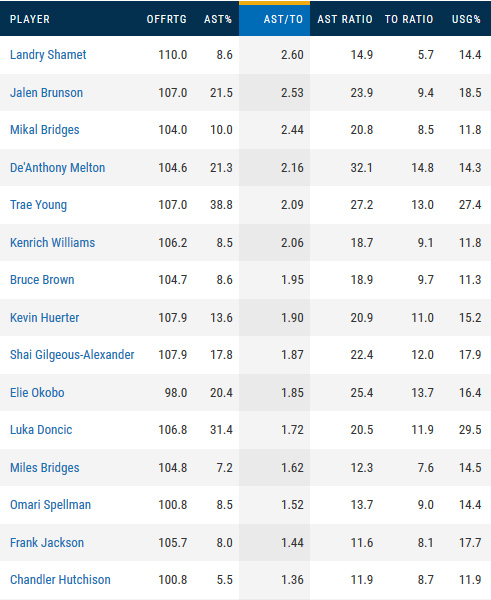 Last season, there were 11 rookies with a positive plus-minus in 750 minutes or more. Of course, one of those guys (Milos Teodosic) is no longer in the league and another (Jawun Evans) was waived by the Phoenix Suns last month. 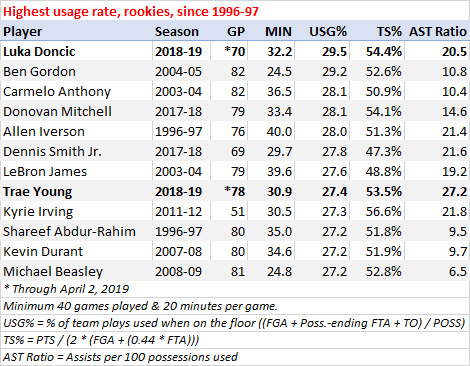 The only other rookies who have played at least 1,000 minutes for a team that still has a (real) chance at the postseason are Shai Gilgeous-Alexander (minus-84 in 2,050 minutes for the Clippers), Bruce Brown (minus-42 in 1,348 minutes for Detroit) and Rodions Kurucs (minus-3 in 1,207 minutes Brooklyn).